We focus on the issues that matter most in our region and the communities we serve. The Chamber serves as the voice of business at all levels of government to help advance the mission of the organization to build business success, advance our region and help build and maintain a strong economic environment in Southwest King County. We are members of the US Chamber of Commerce, the Association of Washington Business (Washington State's Chamber of Commerce), and The South Sound Chamber of Commerce Legislative Coalition. We also regularly meet with the economic development managers of the cities we represent, attend city council and town hall meetings, and take part in various committees and groups that benefit the Seattle Southside Region such as the Soundside Alliance. Transportation infrastructure continues as a priority objective for the Seattle Southside region. 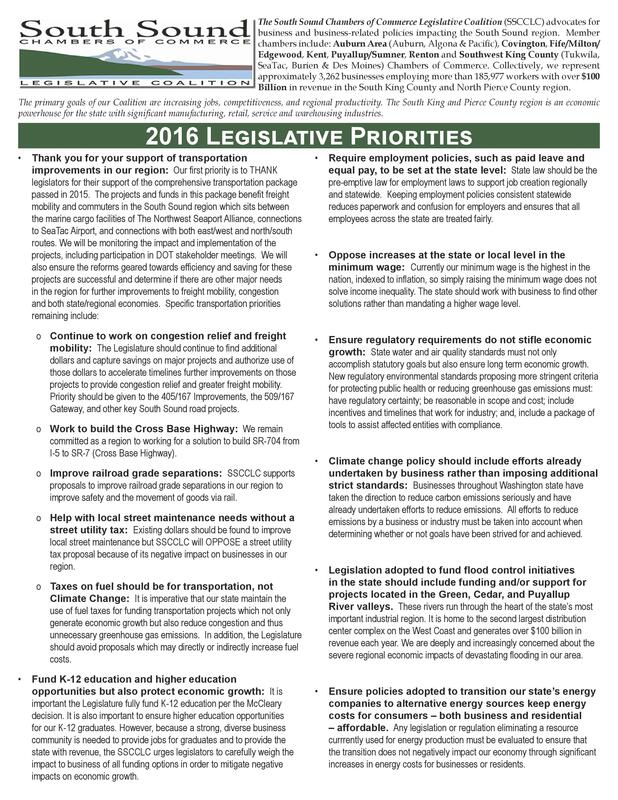 Regional projects passed in 2015 must receive funding, including the Puget Sound Gateway projects. It is imperative these projects not only are funded to completion, but timelines should be moved up to accommodate the region’s traffic needs and maximize cost efficiencies. In addition, support efforts to clarify the decision-making process for, and the Washington Freight Advisory Committee’s role in, evaluating and selecting projects for funding. Preservation projects seeking funding should be evaluated using the same selection criteria as all other projects, without a set-aside of funds dedicated for preservation. The most valuable resource in the Seattle Southside region is the people who live and work here. Our businesses and communities can only prosper with the right investments that improve the ability for people to thrive and find jobs. K-12 Education – The funding for the 2017 McCleary bill (HB 2242) was a positive step forward to ensure students receive equal access to opportunity. However, additional considerations for funding should focus on equity for all students (Special Education, Transportation) in the state and improvement in student outcomes. School districts should be given flexibility with their levies to ensure they can fill funding gaps as necessary based on the needs of their students. Career and Technical Education – The Legislature should ensure that adequate education dollars are going to CTE programs and that all students have access to relevant CTE courses. Our K-12 schools must have the staff, space and equipment to provide students with opportunities for graduation and careers that don’t require a traditional academic education. The Legislature and local jurisdictions should provide for partnerships, strategies and investments that create better bridges from high school to post-secondary career and technical education. Higher Education – Education pathways that facilitate economic growth and include certificate programs, licensing and apprenticeship in addition to traditional associate and bachelor’s degrees have a high value for the South Sound region. These programs, and pathways needed to complete these programs, should be included in any higher education funding plans. Predictive Scheduling – Predictive Scheduling measures could add additional burdens on businesses by eliminating their capacity to be flexible in running their businesses. The potential cost increases incurred by requiring them to pay employees for cancelled shifts, as well as taxing personal relationships with their employees—many of whom value their flexible work schedules, will make predictive scheduling an administrative and financial burden that will limit both economic and workforce development. Housing & Homelessness – The Legislature must ensure Growth Management Act implementation facilitates housing affordable to all economic segments of the population, including the growing homeless populations in our communities. Housing supply must be sufficient to meet actual demand. Solutions could include: allowing more incentives for multi-family housing – including condominiums; and, incentives for development closer to transit stations as transit is expanded in the Region. Mental Health – Investments must be made to ensure mental health care - including mental health care for juveniles - is readily available for ensuring safe and healthy communities. One solution that could be addressed in the South Sound Region is the ability for cross-jurisdictional services to be provided – allowing those who live in Pierce County but work in King County (or vice versa) to receive services in a way that is more convenient for their lives. Criminal Justice – Our local communities depend heavily on the skilled men and women in law enforcement to maintain public safety. Their training and the availability and ease of access to training is paramount to ensure our local police agencies are able to maintain the highest quality of service. The Criminal Justice Training Center should receive priority funding and allocations to ensure their operations are easily accessible and wait times for training are limited. Trade, Aerospace and Manufacturing – The region is uniquely impacted by trade, aerospace and other types of manufacturing. It is imperative that the Legislature retain and support tax incentives that ensure trade and manufacturing firms in Washington State are nationally and globally competitive. As an alternative to differential rates and specific incentives, the Legislature should support general reductions in B&O tax rates, starting with reducing manufacturing B&O rates overall to spur state manufacturing growth. Climate Change – Taxes on fuel should be for transportation, not broader climate change goals . Maintaining the use of fuel-related taxes for funding transportation projects not only generates economic growth it also reduces congestion and unnecessary greenhouse gas emissions through reduced traffic and freight wait times. Trans-Pacific Fiber Cables – The Legislature should act to support the state’s competitive advantage as a “landing site” for trans-pacific fiber cables, specifically cables coming from the Asia continent. Cost comparisons between Washington and Oregon data and fiber hub installations show Oregon’s costs to be significantly lower which is jeopardizing the ability to recruit tech related business to our state and the South Sound region. Economic Development – Our South Sound region is appreciative of the partnerships with our Economic Development Councils. We know that our economy and communities’ benefit from these public-private development partnerships. Our challenges and opportunities are great, unique and diverse in our region and we appreciate the individualized and specific support we receive from the agencies charged with expanding and diversifying jobs in our communities. Therefore, we look forward to continued individualized regional support on behalf and in collaboration with our councils as we work to encourage investment and job growth for our region. Streamlined Sales Tax – The passage of SSB 5089 was intended as a step in implementing sales tax collection requirements on internet sales. Under the national agreement, companies could “voluntarily” collect sales tax on behalf of the member states. If companies chose to “voluntarily” comply they would receive in return, 1) vendor compensation or financial assistance in the costs of collection; and 2) liability protection against back taxes in the event the state came under legal question. South King County jurisdictions were hit particularly hard. The Legislature began appropriating approximately $50 million per biennium in streamlined sales tax mitigation based on 2008 estimates. The actual amount of mitigation was determined by actual loss of sales and use tax, reduced by voluntary compliance. If the Legislature acted on requiring internet retailers to collect and remit sales and use tax the additional tax collection would be attributed to mitigation. As of 2017, there were 57 jurisdictions, including 49 cities, receiving mitigation. Initial revenue estimates resulting from new sales tax collections provided by EHB 2163 indicate that at least 11 cities receiving mitigation will be at a loss when attributing the new revenue source to the mitigation calculation. The State Legislature should continue to fund Streamlined Sales Tax (SST) Mitigation payments for those cities that have not received adequate revenue under the Washington Marketplace Fairness Act (MFA) to offset discontinuing these payments and respectfully request that mitigation payments are included in the proposed 2019-21 Operating Budget. Energy – As utilities continue to face a transformational change in their industry, responding to evolving customer expectations and rapidly changing technological advancements, policy makers need to ensure utilities can be more nimble in a rapidly changing market place. Utilities must be responsive to market changes, as well as customer desire for real-time adoption of emerging technologies that allow for greater control over energy choices, cleaner and greener power – all while maintaining an affordable low cost. Policies encouraging the use of performance and incentive-based regulation, along with appropriate glide paths and compliance tools - to aide in the reduction of greenhouse gas emissions on the electric grid - must be advanced to allow for the transformational changes in the utility sector. The South Sound Chambers of Commerce Legislative Coalition (SSCCLC) advocates for business and business-related policies impacting the South Sound region. Collectively, we represent approximately 3,262 businesses employing more than 185,977 workers with over $100 Billion in revenue in the South King County and North Pierce County region. The primary goals of our Coalition are increasing jobs, competitiveness, and regional productivity. The South King and Pierce County region is an economic powerhouse for the state with significant manufacturing, retail, service and warehousing industries. Member Chambers include: Covington, Fife/Milton/Edgewood, Kent, Puyallup/Sumner, Renton and Seattle Southside (Burien, Des Moines, Normandy Park, Tukwila, & SeaTac) Chambers of Commerce. Transportation infrastructure remains a priority objective for the South Sound region. With the passage of the “Connecting Washington” Transportation Act in 2015, many of the needed South Sound regional projects received funding authorization from the Legislature, including the major Puget Sound Gateway compilation of projects. It is imperative these projects continue to be funded to completion. In addition, the final designs must meet the priority goals of freight mobility and decreased traffic congestion. The most valuable resource in the South Sound region is the people who live and work here. Our businesses and communities can only prosper with the right investments that improve the ability for people to thrive and find jobs. K-12 Education – Find a balanced approach to fully funding education that does not adversely impact the economy of the state or South Sound region. As the Legislature moves toward finding dollars to achieve the McCleary requirements, the SSCCLC will take a serious look at all funding mechanisms proposed and provide a review of impact on our region – both pro and con. The SSCCLC’s expectation is that all funding investment proposals for K-12 education are focused on equity and outcome gains.Career and Technical Education – The Legislature should ensure that adequate education dollars are going to CTE programs. Our K-12 schools must have the staff, space and equipment to provide students with opportunities for graduation and careers that don’t require a traditional academic education. Higher Education -- The members of the SSCCLC place a high value on education pathways that facilitate economic growth and include certificate programs, licensing and apprenticeship in addition to traditional associate and bachelor degrees. These programs should be included in any higher education funding plans. Housing & Homelessness– The Legislature must ensure Growth Management Act implementation facilitates housing affordable to all economic segments of the population, including the growing homeless populations in our communities. Housing supply must be sufficient to meet actual demand. Public/private partnerships - and other resource investments - are also needed to help ensure access to affordable housing and other holistic approaches to solve homelessness.Mental Health – Investments must be made to ensure mental health care - including mental health care for juveniles - is readily available for ensuring safe and healthy communities. Trade, Aerospace and Manufacturing – The South Sound region is uniquely impacted by trade, aerospace and other types of manufacturing. It is imperative that the Legislature retain and support tax incentives that ensure trade and manufacturing firms in Washington State are nationally and globally competitive. Climate Change – Taxes on fuel should be for transportation, not Climate Change: It is imperative that our state maintain the use of fuel taxes for funding transportation projects which not only generate economic growth but also reduce congestion and thus unnecessary greenhouse gas emissions. In addition, the Legislature should avoid proposals which may directly or indirectly increase fuel costs as it evaluates alternatives to the gas tax for funding transportation. Preservation of Buildable Industrial Lands – In order to facilitate future economic development, a balanced economy and the creation of living wage jobs, the Legislature should act to discourage changing local land use designations of, or encroachment upon, buildable industrial lands. Formed in 1904, the Association of Washington Business is Washington’s oldest and largest statewide business association, and includes nearly 8,000 members representing 700,000 employees. AWB serves as both the state’s chamber of commerce and the manufacturing and technology association. While its membership includes major employers like Boeing, Microsoft and Weyerhaeuser, 90 percent of AWB members employ fewer than 100 people. More than half of AWB’s members employ fewer than 10. For more about AWB, visit www.awb.org. 2% of membership dues are used for lobbying and government advocacy and are not tax deductible as a business expense. For more information please contact the Chamber Office.